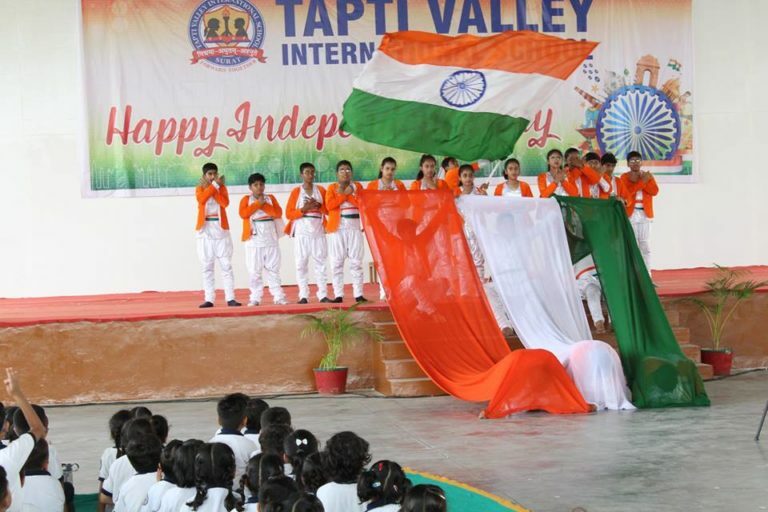 Tapti Valley International School, celebrated Independence Day with unprecedented patriotic fervour on August 15, 2018. The gamut of celebration activities held on the campus consisted of cultural performances by the students across all grades. The entire school assembled in the school dome. The Principal along with a young student hoisted the Tricolor followed by the national anthem that echoed in the entire campus. The program then commenced with students of grade 1&2 who mesmerised the campus with a melodious tiranga group song followed by a patriotic group song which filled everyone with pure patriotism. The secondary students were a delight to watch who displayed the essence of Indian culture in the form of Folk Dances. A tribute dance for our soldiers was the highlight of the show. The show ended with the song Vande Mataram sung by the entire teaching staff of the school. Our Principal, Mr. Atul Kumar Srivastav and our chief guest Mr. Vishnu Chaudhary gave a speech reminding the students and the teachers of the sacrifices made by our great freedom fighters and urged us take a pledge to serve our motherland, India bringing glory and laurels through our dignified deeds. At the end the students enjoyed a tricolour brunch. Indeed true patriotism filled the air with joy!! !